Happy Thursday! I was in need of a few birthday cards so I decided to whip some up and share them with you. I watercolored some random backgrounds then used my rectangle dies to cut some backgrounds. From Jaded Blossom I used Rectangle dies, Scallop Rectangle Dies, card mat dies, flag dies, heart dies, birthday dies, coffee dies, and spring dies 2. Stamp sets I used are Supersized Birthday Greetings and Coffee Break. Thanks for checking out my cards today! 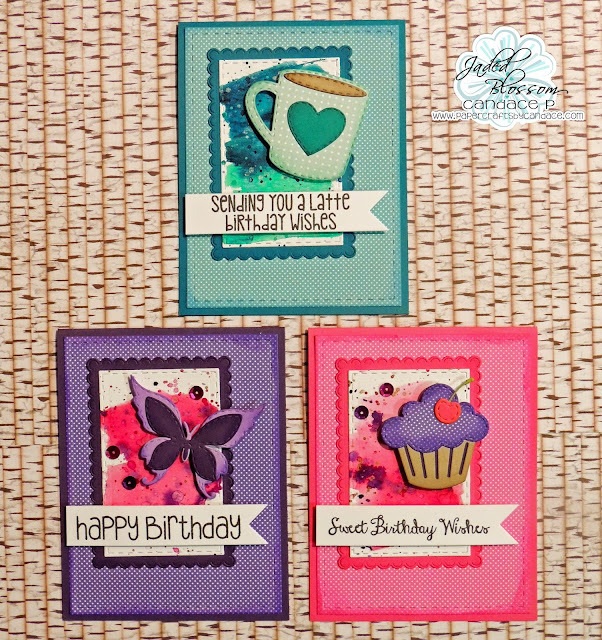 Love the water colored background... pretty cards! Awesome background! I love your pretty cards! Ekkkkkkkkk they are all so pretty!